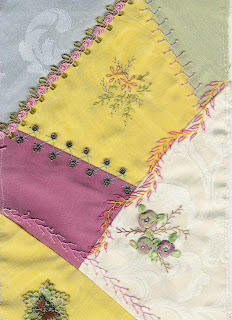 Here are five more pictures of the 2009 MCC crazy quilt. 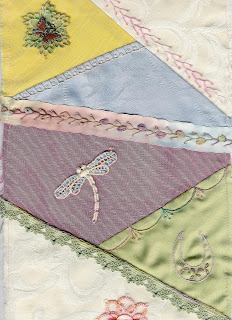 These are pictures of the long 54 inch border that will go along the right side of the quilt. The way I loaded the pictures, the top of the border is the last picture and then work your way up. 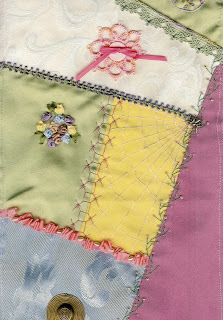 I am getting a little bit nervous as this quilt is due at the end of March and we are not completely done. I think by this time last year I was piecing it together. I know we will pull it off though, we always do! P.S. Isn't the little Hankie girl cute? 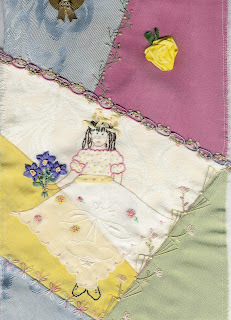 It's going to be a beautiful quilt Val! The hanky girl is awesome! 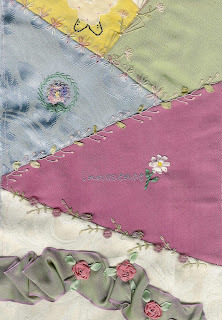 Everything that's done on there, from the simplest seam to the hankie girl (who is wonderful!) is so effective. I love the way you've used laces and ribbons. Best of luck getting everything finished on time. Val,it's going to be just gorgeous! Love all the colors.